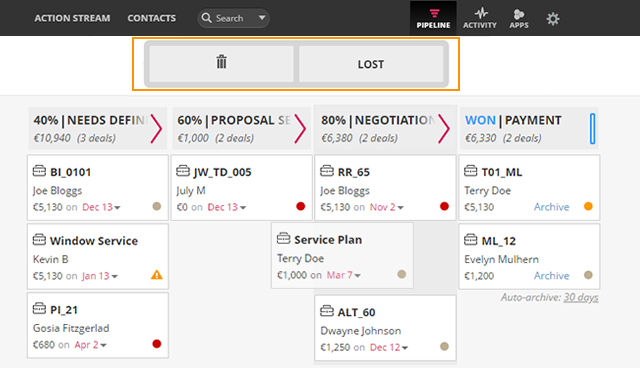 In the Pipeline you can choose the Forecast view or the Kanban view. 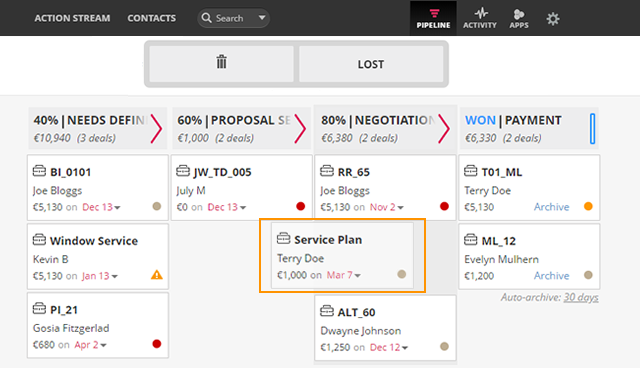 Once you have selected the Kanban view in your Pipeline you can 'drag and drop' a pending deal to the next stage, delete a deal and mark a deal as 'Lost' or 'Won'. Select a deal card and simply 'drag and drop' to your preferred deal stage. Note: Manual sorting applies (your deal will remain in the same position as you dropped it unless you click the resort icon). Click the resort icon to reorder deals by expected close date or amount. Note: Under Pipeline Values, you have the option to choose from " On refresh sort by: Expected close date or amount". Select a deal card and 'drag and drop' under the Won Column. Note: Deals will be automatically archived after 30 days. 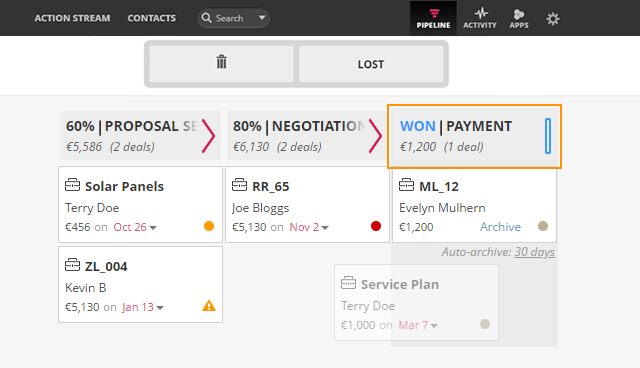 Note: Archiving a deal will not delete the Won deal from your account. 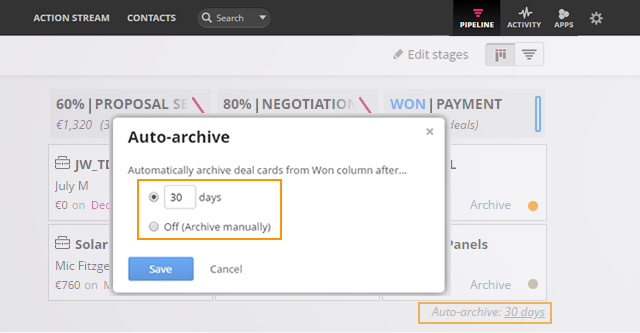 To configure the Auto-archive options click on Auto-archive: 30 days → choose the number of days or turn off Auto-archive. Select a deal card and 'drag and drop' into the trash can icon or 'Lost' bar. 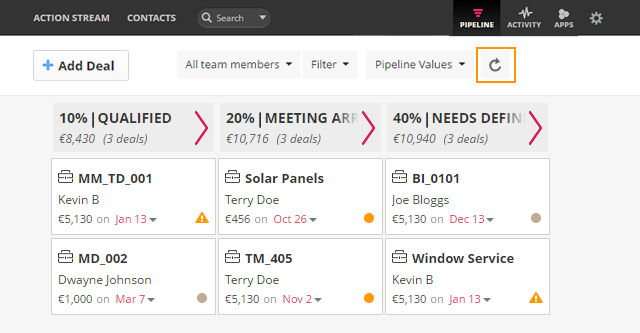 Deal amounts and number of deals will update immediately when you move a deal from one deal stage to another. You can also 'drag and drop' attachments into the Notes section. 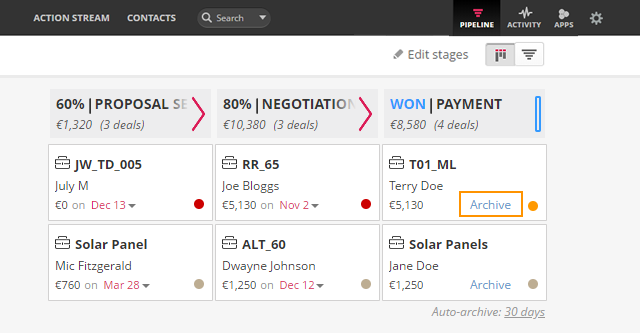 Manual sorting is applied when you 'drag and drop' a deal card until the page is refreshed.